London’s east borough certainly has a lot to offer. Amongst Hackney’s wonderful pubs, handfuls of delicious restaurants and generous helpings of edgy things to do, we’ve found 7 seriously good reasons to visit the happening hotspot that’s Hackney. Located in the effortlessly edgy Queen’s Yard just a short 3 minute walk from Hackney Wick Station, CRATE is a thrifty Londoner’s paradise. The entire venue has a delightfully shabby-chic feel to it with recycled railway sleepers and ladders making up the bar and rusty bed springs transformed into the light fixtures. As you might assume from it’s ‘brewery’ title, CRATE has a massively impressive range of beers including the marvellous concoction that is champagne beer – a hybrid beer with a delicious hint of bubbly! CRATE also serves up cheesy oven-baked pizzas, including spicy salami and Moroccan Lamb. Joined with the buzzy bar/club/music venue Mick’s Garage next door and backing out onto the gorgeous River Lea lined with picturesque canal boats, CRATE is GREAT indeed! Wander a little ways down Hackney’s Mare Street and you’ll stumble across a small neon lit ‘bar’ sign. Follow the arrow down the seemingly unimportant steps and you’ll find an awesome little gem of a bar hidden away from the busy street. Behind This Wall is a speak-easy style cocktail bar and, with its re-launched cocktail menu, it’s fast becoming a favourite hangout for Hackneyites (let’s pretend this is a word). Behind This Wall also offer the happiest of happy hours with £1 oysters from 6-8pm daily as well as an innovative selection of bar snacks including Hawaiian Poke Bowls! We recommend the Salem Witch Reviver cocktail – an exciting take on the classic espresso martini mixing white rum with coffee and maraska liqueurs and the flavours of maple-candied apples. Springfield Park is a beautiful open green space in the heart of urban London. Open to the public in 1905 and an impressive 14.73 hectares in size, the park is particularly breathtaking this time of year with the dusky oranges and fiery reds of the changing Autumn leaves. This restaurant, bar and live music venue is as cool as they come and also boasts a lively crowd no matter what day of the week! Carnivorous Londoners will feel particularly at home here with their meaty, cheesy, juicy burgers cooked to perfection and best served with a nice cold pint from their wide selection of beers and ales. If you fancy something a little more adventurous then we suggest the Nagoya burger made with soft Tempura crab and coriander Asian slaw and wasabi mayo. Before you go be sure to check out the various club nights and live music events hosted on weekends and be ready to get your groove on! This funky independent cinema complete with a buzzing cafe/bar located downstairs, Hackney Picturehouse shows a range of films including new release top blockbusters, quirkier art-house films and classic gems of historic cinema on ‘Vintage Sundays.’ With a tempting selection of burgers and beers from the cinema’s in-house bar, forget the popcorn, it’s time to upgrade your chose of movie grub! Broadway Market has over 80 stalls offering a wide selection of cheeses, meats, breads and other general ‘market-y’ things. As well as fresh produce, Broadway Market is also home to amazingly moreish street food, vintage clothes shops, pottery and jewellery stalls and fantastic restaurants and pubs. What more could you want?! Quite possibly the Borough of Hackney edgiest area, Dalston is home to many fantastic bars and clubs. One of which is Ray’s Bar. A partnership between the unbelievably tasty Voodoo Rays Pizza and ultra-hip Dalston Super Store sees the birth of this happening basement bar. With it’s cocktail menu separated into ‘Starters,’ ‘Mains,’ and ‘Desserts,’ to guide you through your boozy meal as well as in-house DJs playing Vinyl Records, Ray’s Bar is definitely worth dancing in to. Plus, Voodoo Rays Pizza is located just above the bar offering you cheesy, doughy deliciousness to sober you up; plus everyone knows pizza is the best drunk food anyway! 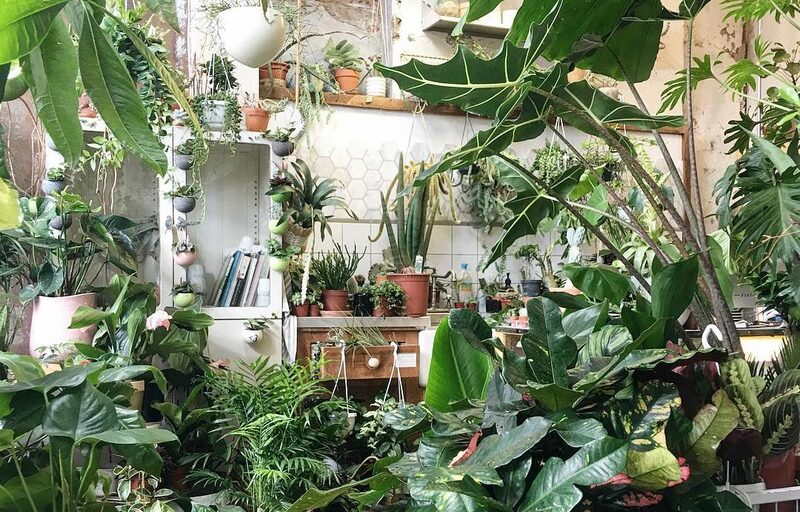 Conservatory Archives is a foliage haven on Hackney Road, and it’s an Instagrammer’s dream. Their east London store and showroom is open 6 days a week (Tuesday – Sunday), and staff are always on hand to provide expert advice. So, even if you’re the type who probably shouldn’t be trusted with living things, there’s always something you can take home with you. And don’t visit without a camera or plenty of battery on your phone, because you’ll want to be taking photos from every angle. If you fancy heading North(er), check out what we have to say about Kentish Town.